Reflecting on our past year has been a rewarding task and so it is with pleasure I am able to report on the activities and achievements of the Branch and its members over 2014-15. With a membership of eleven, fun and friendships keep our small band of 9 working well and supporting others who cannot attend. In addition to holding our regular monthly meetings, with an average of 8 attending, members have been involved in, and attended many events including the Bridgewater Wool, Wheat and Wine Fiesta in October and the Newstead Market Day in November. At both of these, members helped the Group President showcase CWA and its work through ACWW. Locals and visitors purchased goodies and went away knowing more about the work we do. Even though not successful in attracting new members to our branch, these events are a worthwhile way to have a CWA presence in the community. Following our usual October meeting, remembering that our country of study was Mongolia, and because of a personal visit, I was able to give a presentation to members and the local community on my experiences in both the vast country side, and the capital, Ulaanbaatar. Guests continued lively comment over lunch. Members have been active in supporting the wider focus of CWA. As a consequence of the August 2014 Group Conference hosted in Harcourt, and in response to recognition that CWA could partner with other organizations to help support refugee women, children and families in Australia, myself and some other delegates formed a small working group to investigate how our Central Vic Branches could help implement the conference resolution. 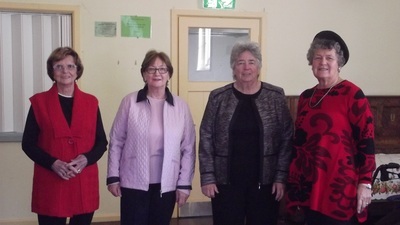 Members met, researched services available in our communities and attended the community forum held in Bendigo. The group agreed that we needed more information on the level of understanding our Branches had of the issues facing refugees and asylum seekers. To this end a sample survey was undertaken at each of the AGMs and the results presented at the February Group Conference as well as being presented at the Social Issues Committee for actioning. As a further consequence Central Vic. Group now has a representative on the Social Issues Committee. Even though I have not been able to attend all meetings I have represented the organization at a meeting held in Bendigo to launch a new campaign for the Patient Transport Assistance Scheme. (This was extensively covered in the 2015 October magazine). Helen, our Treasurer, has also had multiple roles, being the Social Secretary for the Group and then taking up the suddenly vacant role of Group International Officer. Both of these have been undertaken with enthusiasm and skill. In August our Branch hosted the Group “Fun Day” which was run as a “sports” event in the new local sports pavilion. Our member Jenny Parker ran a “Laughter Yoga” session which helped get us in the mood for some serious competition. 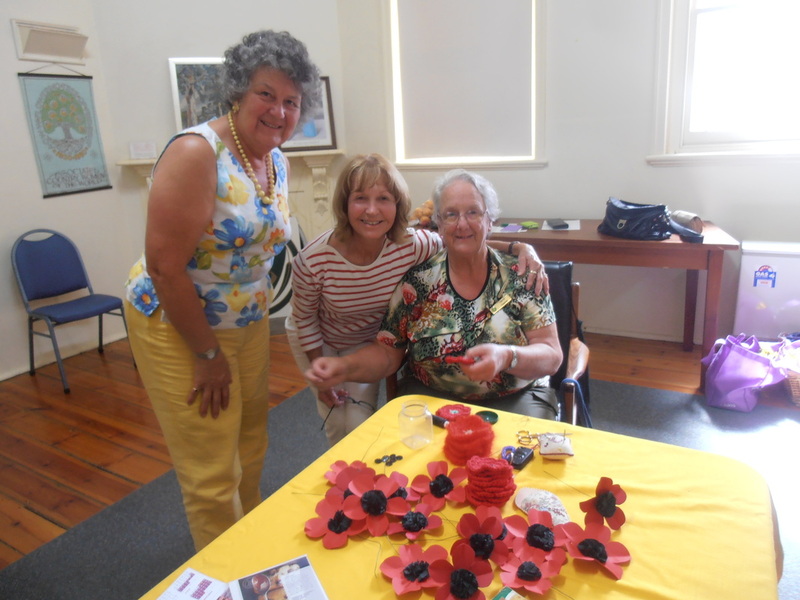 This year being the ANZAC centenary we included a poppy making craft afternoon as part of our March meeting, you may remember the article appearing in the April magazine. 22 crocheted poppies were later delivered to Umina. We also followed up with a community day for locals to make personalized poppies before ANZAC day. To get us into the right spirit, Helen had decorated the room with memorabilia and information. We were able to assemble 3 wreaths to place during the service held at the local war memorial. 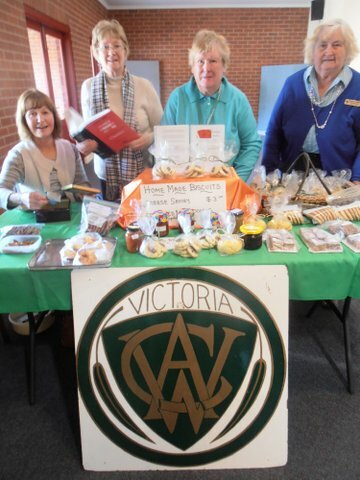 Members made biscuits which were shared amongst the crowd gathered out of the rain, under the pub verandah. Also in April, Castlemaine Botanic Gardens was the venue for a Group International Day combined with Women Walk the World. Members helped the host branch with food preparation, setting up and cleaning up. Members Helen and Darryl attended Umina for the International Day speaker on Cameroon and photos taken by Darryl on the day appeared in the magazine. Our own day to celebrate Cameroon was a lunch provided by Helen and an informative report on history and culture of Cameroon by our International Officer, Janet. April was also our Tillow Fashion parade which is our major fund raising event with 10% of sales coming to the Branch. All attending enjoyed our “Lucky Dip”, which was a fun way of boosting funds to pay for the day. In May we organized a “Friendship Day” and invited other community groups to join us at Cricket Willow for lunch and a tour of the historical buildings, original cricket bat making and the memorabilia collection. May is cold in the Hepburn hills and only a couple of hearty souls joined us on the day. Not deterred we moved on to the Chocolate Mill at Mt Franklin for a hot drink before heading to the warmer climes of Newstead. Three members attended the 87th State Conference in Bendigo and were able to keep us all abreast off news from the front. Extensive reports were read out at our June meeting. It was at this meeting that we allocated $150.00 to the Nepal earthquake appeal. For our next event we had planned to join with the “Men’s Shed” for a white elephant auction but, life was getting in the way so this has been kept as an option for next year. Instead, Darryl planned a mystery tour for the July meeting and lunch. Members were surprised to be taken on a road less travelled to Guildford Tea Rooms. For some, the journey sparked old memories of the area and provided interesting information over lunch. September and I was busy with the RM Show volunteering and we held our 2nd “Spring Fling”. The focus of these days is the agricultural theme of CWA and we were lucky to have a Harcourt Branch member, Meryl Adams, as our guest speaker on “Bees & Honey”. Our member Jill provided the venue in her very spectacular garden, Forest Edge. The day buzzed with activity enjoyed by all. Jill has also been our Birthday Secretary, always ensuring special days are remembered with a card and small posy from her garden. Most months we have held a lunch time stall in conjunction with our meetings. Members donate all the goods and we now give 20% of money raised to Pennies for Friendship with the remainder being used to run things like the poppy making work shop. At our December meetings we have a collection envelope for donations to the Salvation Army Christmas Appeal and during the year have responded to small requests from other organisations. Meetings and news are reported in our local newsletter the Echo, and we try to have a photo each time. Supporting local endeavours is important in a small community so we follow our meetings by joining in the community lunch in our community centre. This provides another opportunity to advertise CWA and coming events. Our plan looked good in January when we gathered in the cool of the home of Marion to map out the events for 2015. But, we have had our share of illness and misfortune during this year and through supporting each other our little band has still been able to do some productive and fun things. We have done a lot in one year both in the Branch and for the Central Vic Group so, thank you for your support and patience. A special thank you to Helen, who has done a spectacularly proficient and competent job as a first time Treasurer. Her reports were always available to insert into the meeting agenda. My thanks to our President Cheryl who was available to help remind me of content for the minutes and ensure my spell checker had not missed anything. This reflection helps explain why we enjoy a break over summer, so I would like to thank all the members for the hard work done during the year and look forward to our Christmas gathering. It seems quite some time since I last wrote. For me it's been a busy but good year. I've just returned from New York City and Los Angeles with my two daughters. A couple of months before that I went to Hawaii with my eldest daughter and her family. And even when I'm home I'm not home much. When I get a bit lonely sometimes I go and visit either of my girls. Our CWA club is getting smaller and smaller but we do have a couple of new younger members, which is great as they are keen and do most of the work. We've tried to get new members but with so many women working outside the home it's not easy. Most of us have other commitments. I'm just a member now and I love it. Over the years I've held all of the offices. So now I'm happy just to be a member. Last week we had a fun day out at one of our member's lovely gardens. We had a guest speaker who spoke about bees and bought a hive. They explained just how hard working and clever bees are. Later this month we are having a fashion parade and have invited other clubs to it. What we've noticed in the last few years is that people aren't sending their rsvp back. We end up having to ring individuals for catering purposes. Your club seems to be so busy. What have you got planned for the rest of the year? I hope this finds you and Colin in good health. Please send Newstead CWA's best wishes to your members.